﻿ Hotel Long Prairie MN, Hotel in Long Prairie Minnesota. There are 11 standard motel rooms, 8 of which consist of one queen size bed and 3 that consist of two queen size beds. We have added a recliner to the large corner 2 bed unit for extra seating. These rooms have a compact bathroom with a shower behind the bathroom door. There is a microwave, small refrigerator and 4 cup coffee maker and color cable TV with remote control. There is a room air conditioner and individually controlled hot water baseboard heat. We offer two smoking rooms; one with one bed and the other with two beds. 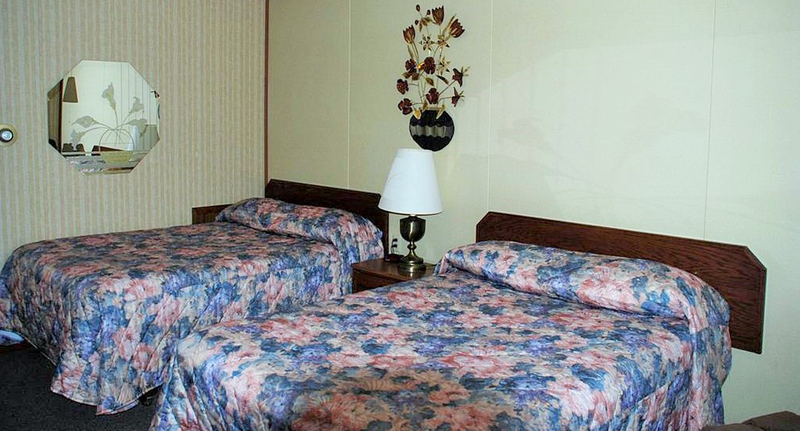 The other six rooms at our motel consist of our two bed deluxe rooms. Four of the rooms have two full size beds while the other two rooms contain one queen and one full size bed each. One of the six rooms is a smoking room (2 full size beds). The bathrooms in these 6 units are very spacious and contain a large vanity area with huge mirror and a door that separates the sink area from the tub/shower combination and stool. There are the extra amenities of a wall mounted hair dryer as well as an iron and ironing board.